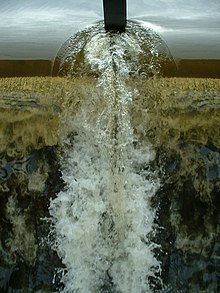 Turbulent flow around an object. Borrowed from Latin turbulentia, or from turbulent +‎ -ence. (uncountable) The state or fact of being turbulent or agitated; tempestuousness, disturbance. (uncountable) Disturbance in a gas or fluid, characterized by evidence of internal motion or unrest. (uncountable) Specifically, a state of agitation or disturbance in the air which is disruptive to an aircraft. An instance or type of such state or disturbance.